On the aRocket list, we get the occasional individual proposing methods to put payloads into space using mega-structures instead of rockets. 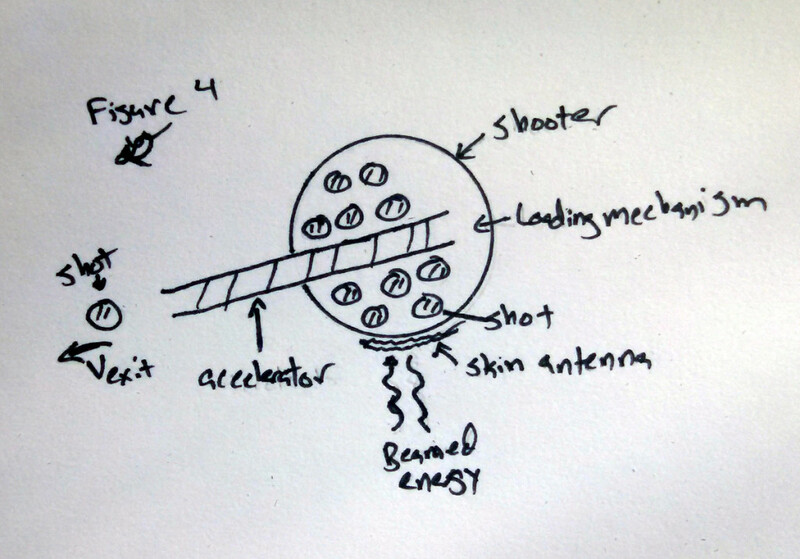 This is in response to the suggestion of dropping the payload down and out a hole though the center of the Earth using a drop tower, though it could be rewritten for most novel space launch concepts. A modest proposal for preventing the theorist from being a burden to this list, and for making a non-rocket space-launch that is beneficial to the publick. You don’t need a drop tower; what you need is an elastic collision at the center of the Earth. Imagine a mass of weight 1 kg at the center of the Earth and a mass of 10 kg dropped from the Earth’s surface down a tube. At the collision, the 10 kg mass is travelling 8 km/s. After a perfectly elastic collision, the devising of which is left as an exercise to the reader, The 10 kg mass is travelling at 6.5 km/s and, more importantly, the 1 kg mass is traveling at 14.5 km/s! This speed decreases to 12.1 km/s at the surface which is more than enough speed to escape the Earth (11.2 km/s escape velocity). Low drag, converting velocity into the desired direction, and aerothermal heating are left as exercises to the reader. See Figure 1. Now, you may ask, why bother going to the center of the Earth at all. Isn’t it a deep, hot hole and, thus, quite hard to drill? Why not just string together our perfect momentum transfer system into a series of bounces at the Earth’s surface to achieve high velocity. If we start with a moderate velocity of 0.3 km/s, easily achievable, and our 10-1 mass ratio, we achieve orbital velocity in 6 bounces! Unfortunately, at a mass ratio of 100000-1. Well, if we increase the initial speed to 2 km/s, still in the relatively easy range, we only need 4 bounces for escape velocity with a 1000-1 mass ratio. Hmm. Let us drop the mass ratio down to 2-1. Now we need 7 bounces but we achieve a 32-1 mass ratio which is not bad at all. See Figure 2. 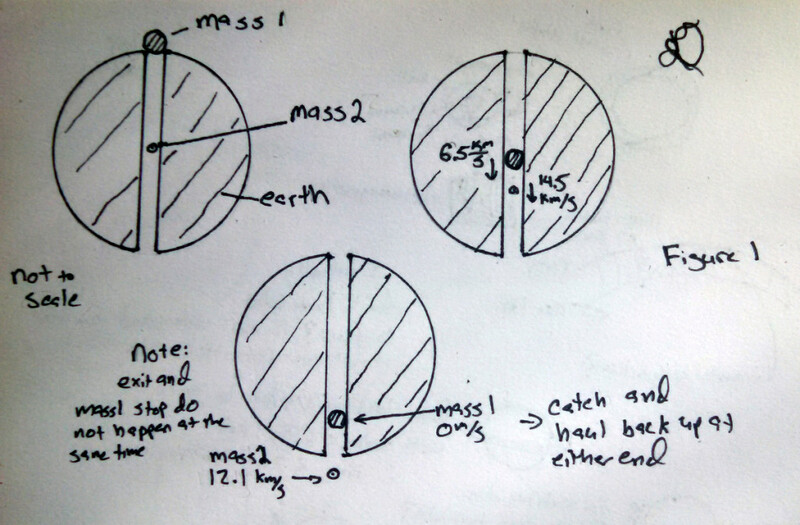 Perfectly elastic collisions are hard to achieve in large objects, but we can mimic them by throwing mass 2 off of mass 1; we just need a rail to accelerate mass 2 located on mass 1 and, instead of using stationary power, we have to beam the power to the moving mass 1. Beaming high power is left as an exercise to the reader. Now we can aim the masses and don’t have to stick to a fixed track, so we can achieve any given orbit! See Figure 3. But we have to build all of these masses and mass drivers and that could be expensive. If we would stop and think for a moment, we see that we could just build one large flying mass and throw a number of smaller masses off of it. 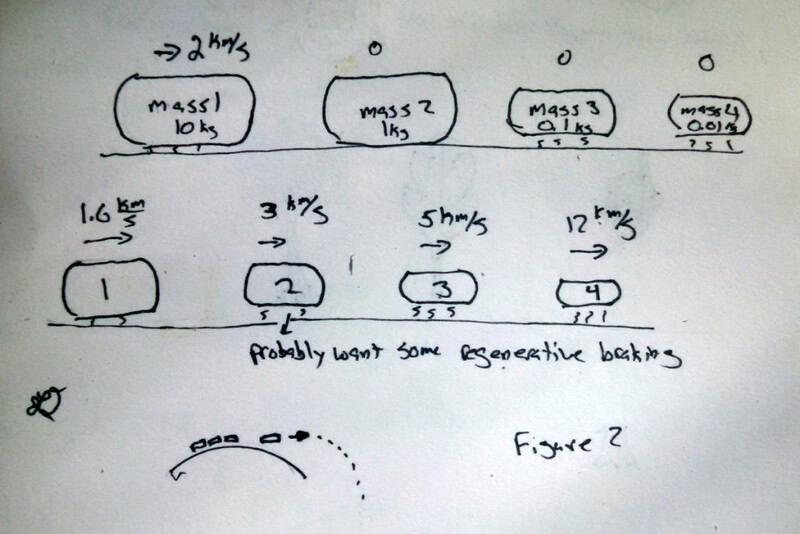 On the plus side, we lose weight as we shoot out mass which makes each additional mass add more velocity. If we stick with our 2 km/s mass driver, we have to go down to a 20-1 mass ratio (initial mass ratio) and it takes 19 pushes to achieve orbital velocity with a 20-1 mass ratio. But we only need one rail to achieve this! See figure 4. Beaming power is hard and unproven technology. But we could generate the power on board, either through nuclear or chemical reaction. This might take up a fair bit of the mass on the flying shooter mass but, it if all else fails, we can always just up the mass ratio to accommodate the generator. 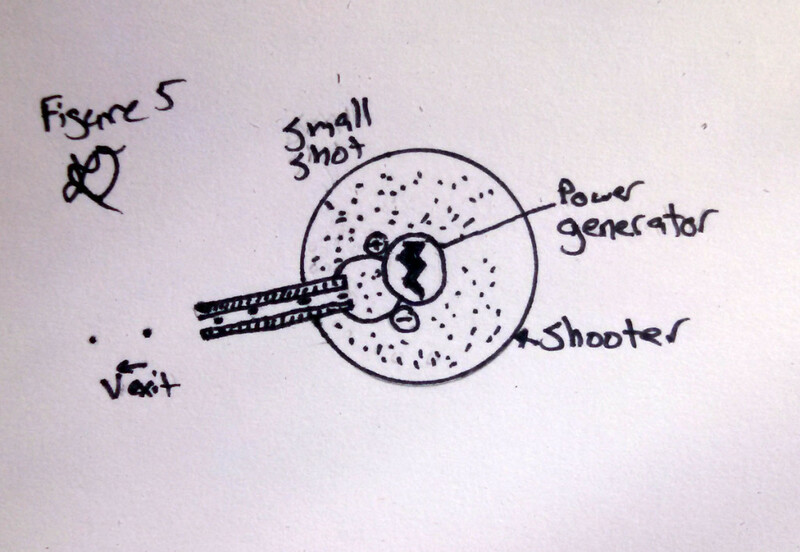 Also, to keep the generator from having to store energy between shots, the shot mass should be made as small as possible. Deriving the ideal shot out mass for final speed when using a very large number of small shot masses is left as an exercise to the reader. See Figure 5. But wait! Two more finishing touches and we might make a practical system yet. It may be possible to find a way for the shot mass to generate the energy before it is thrown overboard. We can make the shot out of a variety of chemicals that generate energy when combined, for example the thermite reaction Fe2O3 + 2 Al → 2 Fe + Al2O3. + heat. Better yet, many of these reactions have gaseous by products and gasses are easy to accelerate using a simple converging diverging nozzle. For example, O2 + 3 H2 = 2 H2O+ H2 + heat which, at the reaction temperatures, are gasses the can be accelerated easily to 4 km/s which rather simplifies the shot accelerator design. Determining the optimal chemicals is left as an exercise for the reader. See Figure 6. I profess that I have not the least personal interest in endeavoring to promote the necessary work; having no other motive than the public good of my country, the advancement of our technology, providing for the satellite industry, relieving the cost burden on space access; and giving some pleasure to the inevitable sponsoring government agencies. * I think I shall now go forth and gather a group of devoted amateurs to develop this crucial technology. Perhaps create an email list for people devoted to find affordable, safe, and accessible methods of building such a device. 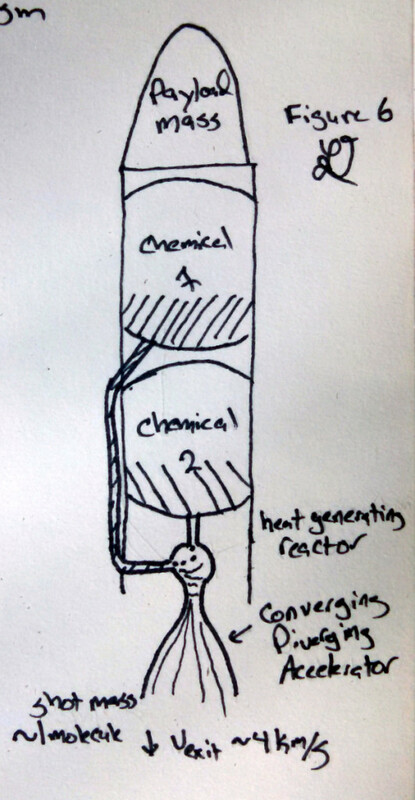 I will call it the amateur stored energy shot reaction driver society or aSesrds for short. Anyone who wishes to use these ideas for the betterment of society can have them for a single penny. “If each of the initial elastic masses are made of convenient in-situ earthen resources, we might call each a ‘rock’ from its Terran origins.